Water… Earth… Fire… Air. Long ago, the twelve tribes lived together in harmony. Then everything changed when the Roman Empire attacked. Only the Avatar, master of all four elements, could stop them. But when the world needed him most, he vanished. A hundred years passed and my brother and I discovered the new Avatar, a carpenter named Jesus. And although his airbending skills are great, he still has a lot to do before he's ready to save anyone. But I believe Jesus can save the world. 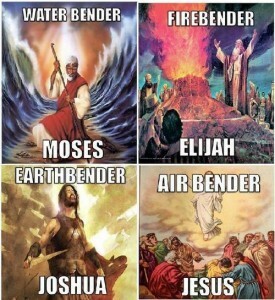 Jesus also has Waterbending down. When he masters Earthbending and Firebending, he can return and take his place as the everlasting Avatar King. ← Interview with Me–SFFWRTCHT Twiter interview all in one place on SF Signal.